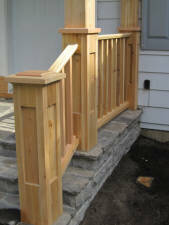 We're a general contractor serving the Ottawa, Ontario area. Although we do all kinds of construction, our reputation is built mostly on many years of finely crafted natural stonework and detailed ,careful,carpentry & woodworking. All of our work comes with a 5 year warranty. We have a special interest in doing unusual or challenging work. We're particularly well qualified to do work that combines natural stone with carpentry and woodworking. We design and build porches, decks, pergolas and other outdoor structures, additions and sunrooms We have done over 2000 projects in the Ottawa area since 1981. Click on the links above to see examples and descriptions of some of the work that we have done. We also do design and construction of natural stonework, including flagstone entrances and flagstone patios , natural stone walls , fireplaces, house facing, and natural stone floors. We also repair and rebuild stonework . In conjunction with our stonework and decks, we do landscape construction, including brickwork, planting bed construction, and sodding. Our goal is to design and build work that is permanent, functional, simple, and graceful, while maintaining individual character and vitality through careful craftsmanship and the use of natural materials, primarily wood and stone. We aim to work in a state of mind/ methods of practice that make the construction process a predictable, pleasant and satisfying one for everyone from clients to labourers. The design-build process starts with your email or phone call. After collecting basic information on the phone or by email, , we usually meet with you on the site to discuss the situation, your needs and tastes. There is no charge for this initial meeting. We can describe in general at this time what we would recommend and an approximate cost.If our suggestions are of interest to you , we will do a design on paper with written quotation. Usually, this initial sketch is also without cost.Should you accept our proposal, we then sign a contract and schedule the work. Timing of the work can vary a lot with the time of year. Advance planning is always a good idea. For a consultation call 613-286-9908 or email fredmacmaster@summerstone.com.